'Humans make rainforest more flammable' Jump to media player Human disturbances are making the Amazon rainforest 'more flammable' say researchers. 'Lead shot is poison for hunters' Jump to media player Why one Danish hunter campaigns against the use of lead ammunition. Catching Brazil's illegal loggers Jump to media player The BBC's Wyre Davies has been out with Brazil's environmental police, as evidence shows an increase in illegal logging and deforestation in the Amazon. Why the Amazon rainforest is burning Jump to media player The Amazon is a wet jungle, and hence should not burn - but over the last decade, vast areas of the Amazon have been lost to fire. 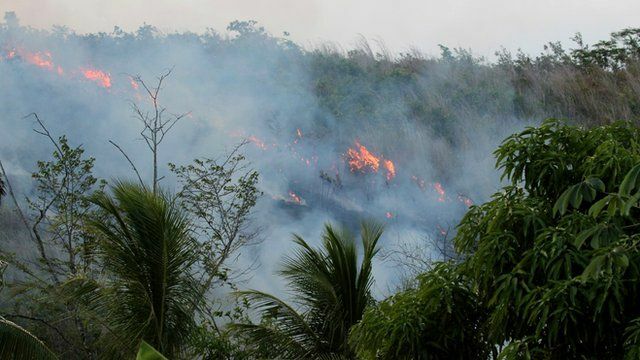 Human disturbances are making the Amazon rainforest more flammable, according to researchers. This is one of the conclusions of a two-year study of the Brazilian Amazon, which has revealed that even areas of protected forests are degraded by human activity, including logging and fragmentation - increasing the likelihood of wildfires. While the Brazilian Amazon is protected from large-scale deforestation, this new study - published in the journal Nature - suggests that more effort is needed to "safeguard the hyper-diversity of tropical forest ecosystems". Professor Jos Barlow, who explains the findings here, shared his team's findings, and exclusive footage they captured of Amazon wildfires, with BBC News.